The African Roots Wine Trust is a wine farm situated in the heart of the Cape Winelands (Lynedoch in the Stellenbosch region). 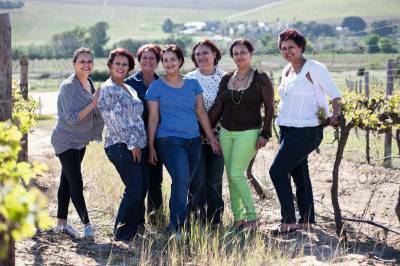 It is the home of the Seven Sisters Wines that has been trading for more than five years. The beneficiaries of the farm are seven sisters who all grew up in the small fishing village of Paternoster on the west coast. This wine farming project is led by Vivian Kleynhans, the middle sister, who demonstrated an entrepreneurial spirit and vision, particularly in the wine industry. Kleynhans approached the Western Cape Department of Agriculture (WCDoA) for funding after she managed to secure 8,7 hectares of land, which was successfully transferred to African Roots Wine Trust. Because this wine farm demonstrated huge potential as a viable business, the WCDoA approved the funding application through their Comprehensive Agricultural Support Programme (CASP). Casidra, an official implementing agency for the WCDoA, rolled out the funding to build a 30 x 12m wine pack house and procure farming equipment/implements, a container, repair of the roads, viticulturist consultation fees, the establishment of 2 hectares wine grapes and production inputs for this Trust. The entire 5 hectares of wine grapes have been successfully established. The project also benefited immensely from the WCDoA’s Market Access Programme, which has enabled the beneficiaries to develop an international market for their Seven Sisters Wines in Europe and Nigeria. Yolanda (Chenin Blanc) has tropical guava flavours supported by passion fruit and underlying vanilla flavours. She is full and rich on the palate with a creamy crisp finish. Enjoy Yolanda with seafood, poultry, veal or pasta. Odelia (Bukettraube) is a naturally sweet wine rich with honey flavours yet perfectly balanced with high acidity and floral aromas. Made from 100% Bukettraube grapes (pronounced Bu-ke-traw-bah), South Africa is one of the few wine-producing countries in the world to bottle this fine wine – a fitting tribute to Odelia’s distinctive style! Twena (Pinotage) is an easy drinking semi-sweet wine. She displays vivid strawberry colours and fresh red berry flavours on the nose. Enjoy Twena with fresh fruit or a light meal. Vivian (Sauvignon Blanc); Experience the full richness of tropical flavours, supported by both spice and vegetal flavours. Serve well chilled as an aperitif. Vivian is perfect with grilled seafood, poultry or veal. Dawn (Shiraz) is a medium-bodied, easy drinking wine with upfront fruit and red berry flavours (no harsh tannins). Enjoy on its own or with a “braai” and light meals. June (Merlot) is soft, dry and well balanced, with delicious chocolate, plum and berry flavours. This is an ideal accompaniment to lamb, steak and grilled vegetables. Carol (Cabernet) is a dry and full-bodied wine with balanced blueberry and vanilla flavours. This wine is soft and easy drinking, but boasts a long finish. Serve with red meat dishes, grilled or stewed. This ideology of branding the wines with the names of the siblings became unique in the wine industry and has strengthened the African Roots’ Seven Sisters Wines’ brand. Their range of wines has been described as ‘magic’ and has become extremely popular overseas. The brand attracted the Americans and the first export was shipped to America and is now being sold in 42 states. The African Roots Wine Project will be more viable in the long run, as they are currently in the process of establishing new vineyards to supplement the wines that they buy from other suppliers.